Bleeding may be caused by any number of injuries such as cuts, lacerations, or puncture wounds from sharp objects. 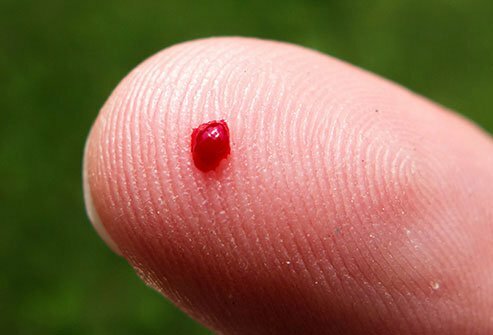 Minor bleeding is very common, easy to treat, and usually has no long-term consequence. Extensive bleeding can be very dangerous. It may cause a drop in blood pressure and decreased organ blood flow, which could lead to shock. For any bleeding that is difficult to control with pressure or requires a tourniquet, call 911 immediately. If a person is bleeding, always check for other injuries such as a significant head injury, fractures, or dislocations. Symptoms that may result from bleeding include pale, cool, clammy skin; fast heart rate, low blood pressure, lightheadedness, unconsciousness, and in very severe cases, death within seconds to minutes. Blood helps clean wounds, so a little bleeding is good. Most small cuts and scrapes stop bleeding pretty quickly, but you can help by applying firm, gentle pressure with gauze or a tissue. If blood soaks through, put another piece of gauze or tissue on top, don't remove the old one or you may separate the wound and start the bleeding again.